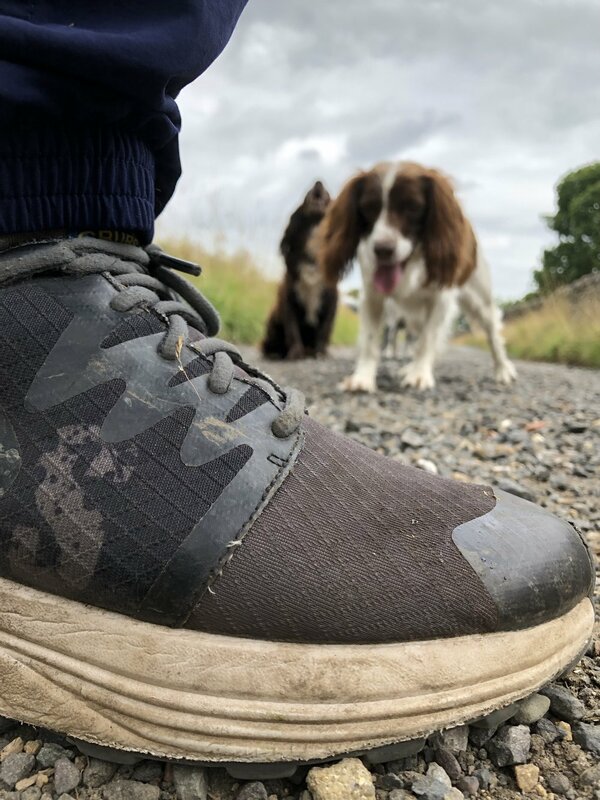 Instagram hit Chilli.Pepper.Dog and her owners Jessica Knowles and Tim Featonby (also known as The Weekend Warriors) tried out the Grub’s Discover Shoe, to see if it was up to the test in conquering the English countryside and keeping up with Chilli. First looking at the Grub’s Discover Shoes they seemed smaller, not as durable and quite frankly a posher version of a trainer (which any dog walker would know in autumn/winter, just won’t do). Lugging your feet around in the sloppy, wet mud, feels like a workout in itself, so we were dubious if they would be up to scratch. We popped them on and ventured across as many different terrains to put them to the test. The last thing you would want is to come home with wet socks and blistered feet. But to our surprise we skipped across the fields and the mud merely licked the sides of the shoes and didn’t penetrate our socks at all. The next part of the journey was through a low stream and again, the water just tickled the sides not making any lasting impression inside our shoes. We then climbed over some stiles thinking they may be too rigid and inflexible to help us shimmy across, but again, it was easy. A stoney path followed up to the hillside and we thought we may have found a weakness…but again the extra thick sole ensured that it didn’t feel uncomfortable at all. We were impressed with how understated such a functional shoe could be. With your everyday walks you use your everyday items; dog lead, collar, whistle, poo bags, treats etc. We were impressed with these shoes so much so, now Grub’s will be added to the list as a no brainer. Taking the dog out for a walk suddenly became a whole lot easier without having to contend with the usual clunky, bulky, boots or wellies. These will not replace our trusted wellies in winter, however they certainly will replace them in autumn, spring and summer to make future expeditions with the pooch are a walk in the park. Overall these shoes are great all-rounders because they are light-weight, comfortable, breathable and waterproof! Last weekend I did a 12 mile walk in North Yorkshire, the weather was glorious and the views spectacular. Whilst my feet were cool and dry everyone else in team was far too hot in their walking boots, I, however had never been so comfortable thanks to my new Grubs Discover shoe. 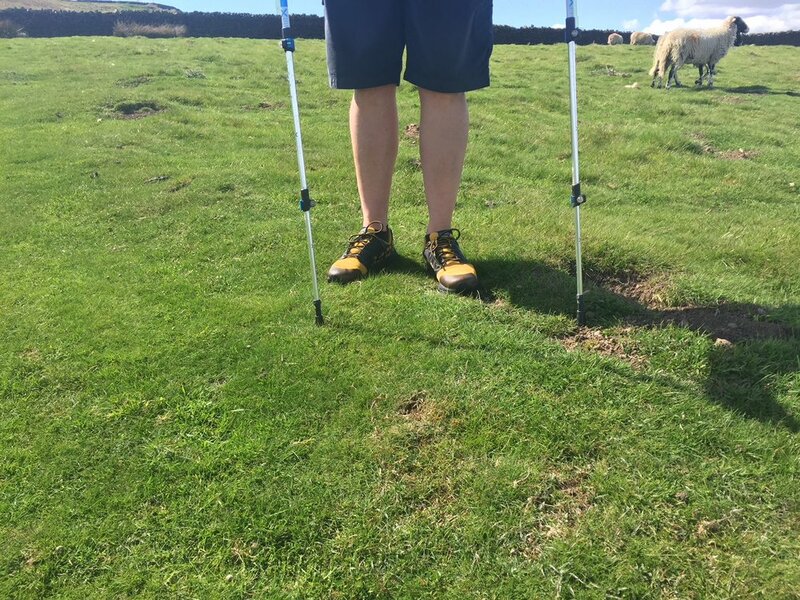 I had worn the shoe the occasional day around the garden, in the office and to my boot camp sessions, however they were relatively new when I embarked on the 12 mile walk around Middleham. They took absolutely no wearing in as they were comfy from putting my first step forward which is always a worry when wearing new shoes for hiking. The lightweight shoe was indescribably comfortable; as I am an avid walker I have tried lots of different footwear whilst on my travels. These trainers were so comfortable it meant I could, without even noticing walk at a faster pace in a more relaxed way. I didn’t complain about my feet all day! With the fantastic weather reaching 26°C over the weekend, I was so pleased I decided to wear the lightweight, breathable show instead of my typically heavy, bulky walking boots. 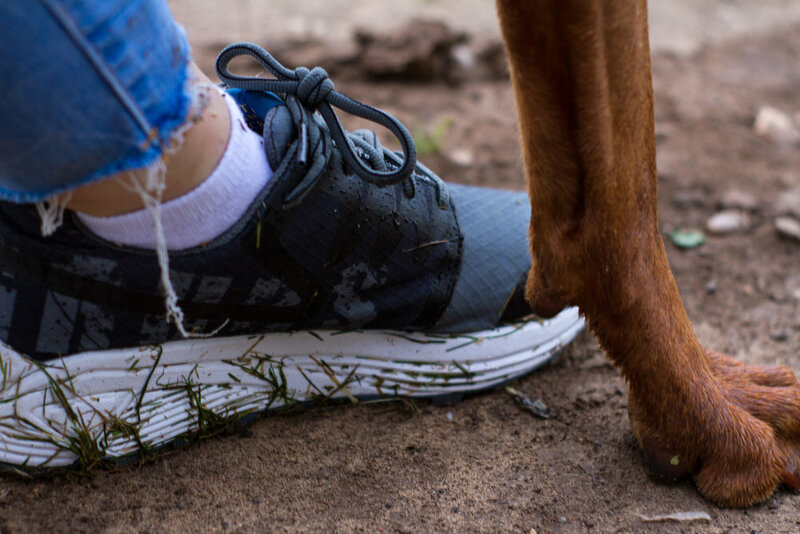 The breathable Discover allowed my feet to stay cool, dry and most importantly comfortable all day. The terrain was a little wet and muddy in places however all it took to get them clean was a couple of wipes with a damp cloth. The last thing you want to be worrying about when out walking in the beautiful countryside is getting your shoes dirty, so next time I wouldn’t think twice about this knowing they can be easily restored to looking new again. The support the shoe gave me was great, I felt confident and stylish in the Black/Burst colour shoe. Brushing past sharp rocks and stones didn’t seem to phase the tough snag resistant outer fabric either. The derby laced opening meant I could adjust the fit whether this be a tight snug fit or to loosen it up when we stopped for a quick lunch break. All four of my friends that joined me on the walk were envious of my comfortable shoes and all now have a pair on order! So if you’re reading this chances are you’ve got a dog and like me plan to get out and about this summer exploring and walking in the countryside, enjoying life together. I bet your pooch is all kitted out with a new collar and lead and you’ve got all their essentials like a disposable water bowl sorted. But what about your feet? Yes! yours human! Well would you believe it, you don’t have to put the leg work in finding the pawfect pair because we’ve made an exciting discovery. Grubs (yes, the welly boot people) have just launched a brand new range of walking boots and trainers and this last couple of weeks myself and my partner, Rod, have been putting the Discover Trainers through their paces. My first impressions of the Grubs Discover Trainer from the website was the eye catching design and vivid colourways. David from Grubs kindly let us choose which colour we preferred so I went for the Fuschia/MInt ones and Rod the Black/Burst, they are also available in a more conservative grey Charcoal and Black for those who don’t want to make a statement! Fashion aside though it’s the comfort and duarabilty of walking shoes that matters to us and the Discover did not fall short. Grubs spent a year developing the Discover and it shows! Unlike the heavy leather walking boots we usually buy the trainers were comfortable from the off and made even quite long, tough walks seem almost effortless. Maybe because these trainers are packed with innovative features such as a RollinGait, a new technology that helps you move with more fluidity which makes them super comfortable and helps to prevent aching limbs. Then there is the Vibram Speed Hike sole which has such tremendous grip that I never once felt I was going to slip even when climbing up quite steep slopes. The trainers really support and protect your feet too thanks to the Stability Cradle and are breathable and completely waterproof thanks to the Hydri-Fuse breathable bootie lining.The thing that most impressed Rod though were the laces, they didn’t come undone once! 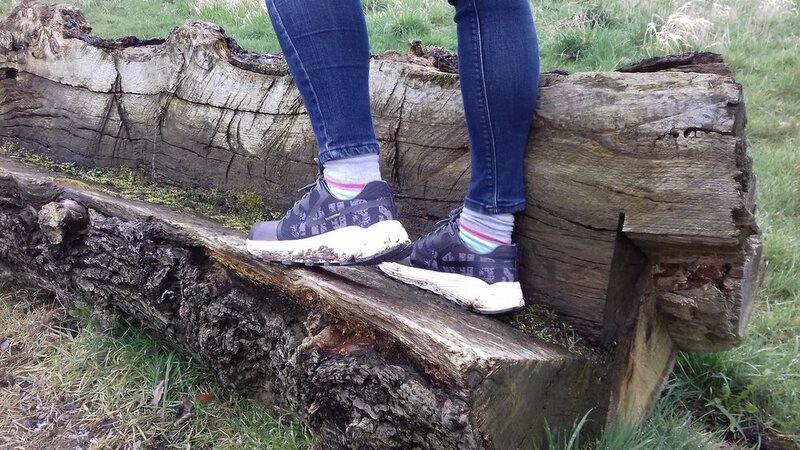 I think that Grubs Discover trainers are just right for spring and summer dog walks and feel so light compared to my walking boots that in fact I once actually forgot I still had them on and thought I was wearing my slippers! One of the most important things to us when we buy walking shoes is the longevity, will these walking trainers survive and still be waterproof in 6 months time? Check back in September when I will report back on where they’ve been and how well they coped. They way things are going I’m really optimistic! Grubs Discover Trainers are available to buy from Grubs Warehouse priced at £119.95. What do you think friends, are you tempted to treat your feet to a pair of Discovers? Why not leave us a comment and let us know. The Alston is handcrafted in supple Iberian leather and fitted with a water resistant breathable membrane. It's iconic scalloped boot pull and leather zip tassel is complimented with leather detailing running the length of the zip and inner boot header for maximum comfort. The boot is double stitched for strength with brogued detail for a unique country look. The Alstons chic lines and tailored ankle is flattering on the leg making it the sophisticated choice whether out in the city or out in the field. Shod with a Vibram Blown rubber sole in a classic commando pattern for sure footed grip and lightweight. The Duxbury boot features a quilted leg with distinctive buckled top strap, external calve adjustment allows the boot to fit most legs. A soft, supple suede exterior with full grain Iberian leather vamp and trim. Fully lined the boot is waterproof to the base of the bellows. A Vibram Bibu blown rubber sole with a classic commando sole pattern give superior grip with lightweight for ultimate comfort. Effortlessly glamorous it’s the perfect addition to your wardrobe. Introducing the Tatton a Chelsea Boot for women designed in luxurious brown suede. Following classic lines and a simplistic design, the Tatton is expertly crafted with supple leather throughout. The combination of the butter-soft, Iberian suede and contrasting elastic inserts offers a play in colour. The Tatton is set on a a rubber tipped leather heel for a comfortable lift, while our elegantly chiseled toe and slim leather sole gives a signature look and clean finish. This is a wardrobe essential of ultimate effortless versatility in both smart and casual wardrobes. 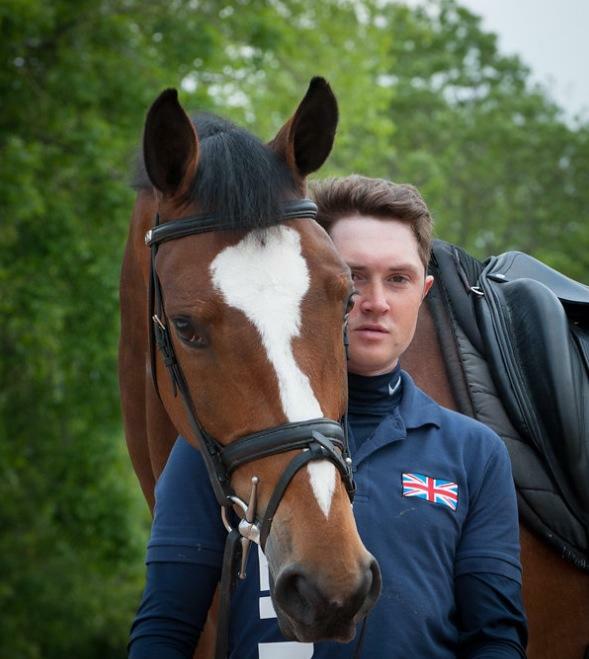 James (29), a talented 4-star eventer rider based in Yorkshire has been out competing on the professional circuit for many years against some of the top names and made his Badminton debut last May. With a wealth of experience and a great team of horses including James’s main horse Talent, the start of the eventing season can’t come soon enough! Said James: “I was so pleased that there was an opportunity to be part of the Grub’s team. David Foster, of Grub’s commented: “We are so excited to work with James and his team, they all work extremely hard and will make a valuable part of our team. Jan Greene who lives in Bolton, loves to walk her three dogs around the fields and at Leverhulme Park, but at this time of year it can be difficult because of the weather and ground conditions. However with the help of her Grub’s Frostline Boots, Jan now has no problems at all. Cold feet are one of the issues that Jan has struggled with ever since suffering from a heart attack and walking has always been an issue, where her feet are always extremely cold despite layering with socks. Even with the fields currently being very wet and boggy, Jan tried the Frostline Boots and it was the first time her feet didn’t suffer from the cold and were warm, because of the 5.0 Technology™ which allows comfort and insulation below -10⁰C to +30⁰C. The Nitrocell™ footbed also has millions of microscopic nitrogen bubbles that insulate the wearers’ feet from cold surfaces. 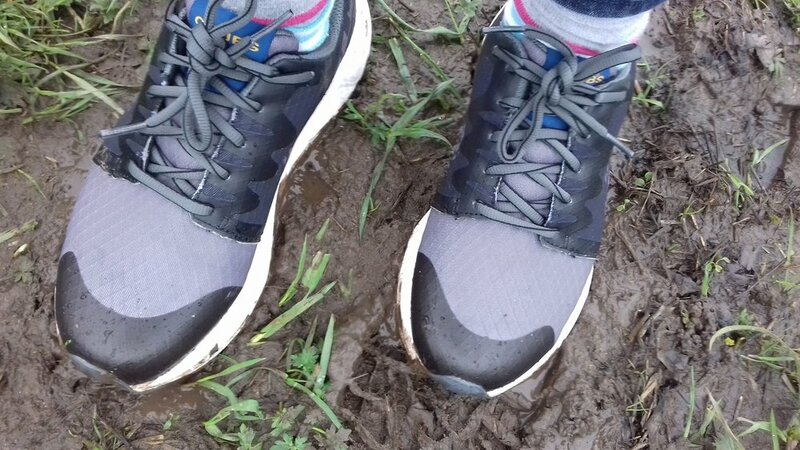 Said Jan: “The boots were so comfy and I didn’t feel like I was being sucked down in to the mud like before with previous boots, I could walk with ease across the boggy fields. Discover (shoe) and Adventure (boot) centre of attention. We are excited to share the news of the launch of our Fitness walking EXPLORE range in San Diego, California. 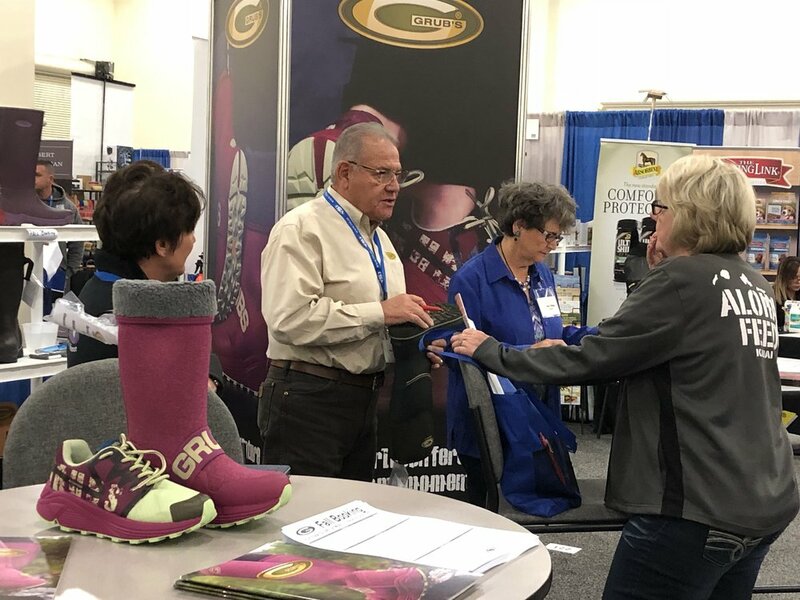 GRUBS and our partners VSI spent the first week of February in Sunny San Diego to launch the ADVENTURE, walking welly and DISCOVER walking shoe to VSI's Dealer network. Our Innovative EXPLORE walking concept was so well recieved that we were amazed at the response and it just goes to prove once again that the West Coast of the USA is at the cutting edge of new ideas and is where its at to find new trends in all markets. "Who let the ducks out!" Californian relaxed cheeky style. The relaxed atmosphere of the Town and Country resort in San Diego made for an easy Californian way to do business. Discover shoes were the perfect footwear for spending the whole day on your feet. 'Flamingo Lawn' relaxed 1950's Californian style Town and country Resort with cheeky touches. After twelve months of testing the new Discover shoe powered by Vibram has arrived. it is exclusively sold on www.grubswarehouse.com for the whole of February before being rolled out to selected partners in March. RollinGait(TM) is a new technology that uses a constantly varied sole that rolls as you walk, actually propelling you forward through your stride, giving a fluidity to your motion and reducing discomfort in lower limbs and spine. 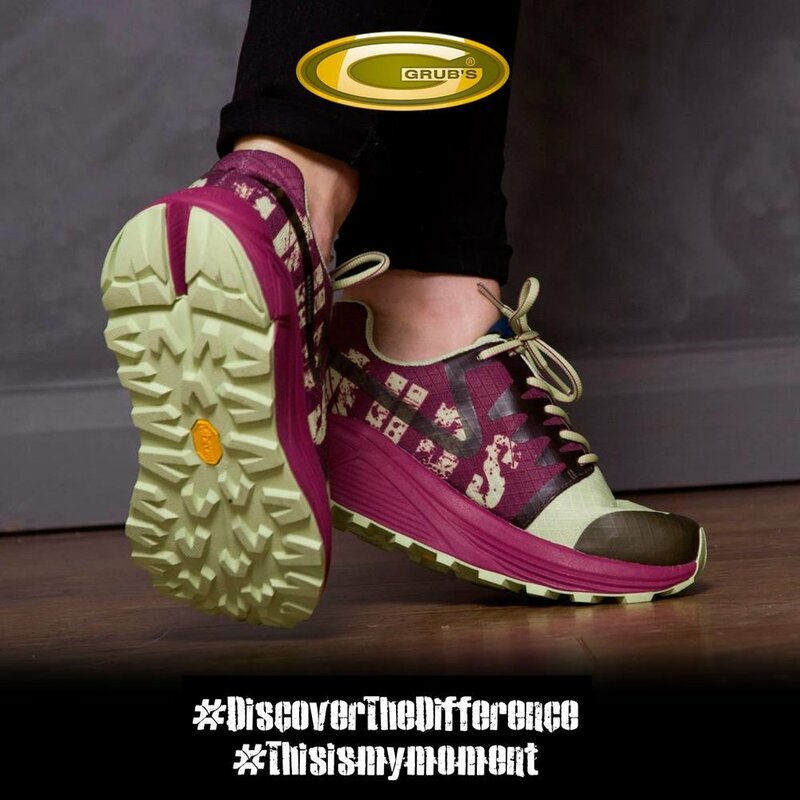 Vibram's(TM) new SPHIKE or SPEED HIKE sole has a ground adaptive split heel designed to reduce impact stress and adapt to the ground surface underfoot. It features a radial lug pattern for traversing slopes and directional chevron cleats for propulsion. A wide heel and forefoot ensures a sure footed anti-roll action. Heel and arch sit deep in the midsole forming a Stability-Cradle(TM) around the foot. Unlike most shoe where the wears foot sits on top of the midsole, the Discover wearers heel is cradled within it, preventing the foot over pronating. The foot is kept in a safe neutral position well protected. The upper features a tough Diamond shaped Rip-Stop nylon upper material to stop snags and tears. Toe and eyestay are reinforced with fused TPU layers that form a strong wipe clean layer in areas of stress and high abrasion. The Vibram(TM) sole wraps up to form a toe bumper for added protection. Derby style lacing allows for both wide and Narrow feet with a bellows tongue to stop micro-gravel entering the shoe and a soft padded topline that fits snugly under the ankle. 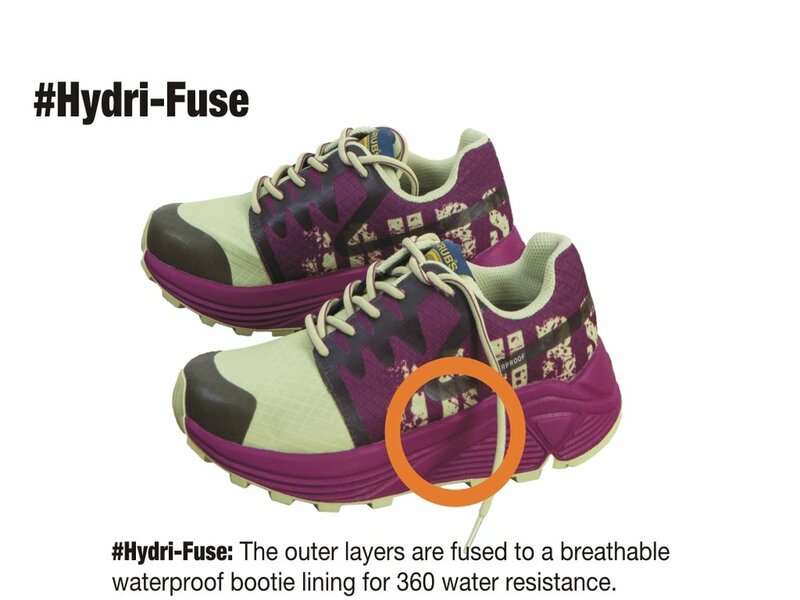 Discover is waterproof thanks to the HYDRI-FUSE breathable bootie lining which is heat fused to the upper to form a single tough and waterproof shoe. We took advantage of the recent bad weather to do some winter testing of our new DISCOVER shoe. The Glen looked magnificent in its first coating of snow though its was much more wet ice at the lower levels. 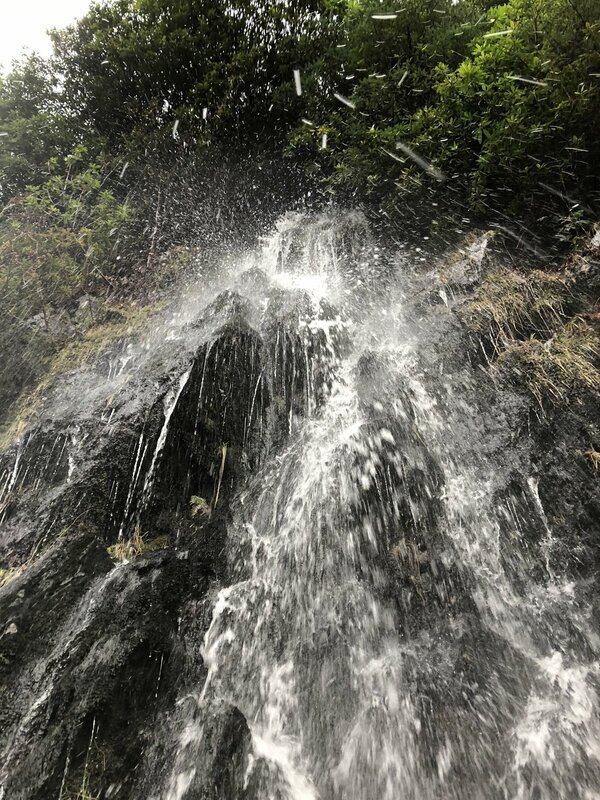 We walked up the glen from Glencoe village to the Falls of Glencoe which were in full flow. The walk was pretty tough going thanks to the amount of wet ice, not even our Vibram sole could cope with some sections and we had to creep up the edge of the road very delicately. Our feet however remained dry and very comfortable through out. A good test day.